The London Book Fair - Part 4 of 5 - What’s the big deal? LBF and rights negotiation. 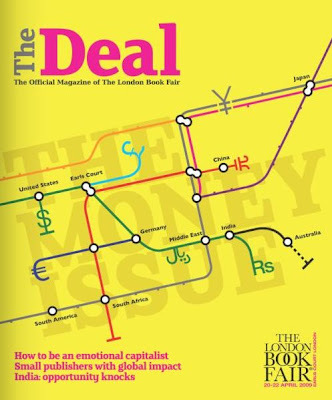 The London Book Fair magazine is aptly named “the Deal”. So what are the deals, that go on at LBF and why is the ‘rights buying’ considered so important at London? The London Book Fair is the global marketplace for rights negotiation and the sale and distribution of content across print, audio, TV, film and digital channels. Simplistically, ‘rights’ is the term used to mean the authorisation to publish work. Agents may negotiate a deal directly with a publisher to ‘first rights’ - the first publication of an author’s work - or rights to publish the work within different geographical areas. At LBF, there is a phenomenal amount of foreign rights selling, which means that once a publisher has agreed to publish the book by an author, negotiations begin with other publishers in other countries who may be interested in publishing the same book in their country. Agents may do this, but generally at large publishing houses it will be the rights buyers and rights sellers whose job this is. The IRC (The International Rights Centre) is a closed-access area for use only by those with a business reason to be there. It looks like a huge old-style exam room with basic, small tables and chairs set up within close proximity of one another, and at times it can be an overflowing ants' nest of activity, with people rushing about from back to back 30 minute meetings. Of course, there may be a really valid reason for doing so, such as Mari Strachan gave in her recent interview here. When she was asked if she would like to see the book in the Welsh language she replied, "most of it is in Welsh - it just happens to be written in English! Seriously, if it were to be turned into Welsh I would have re-write it rather than translate it. When Canongate bought The Earth Hums in B-flat they acquired world rights except for Welsh translation rights, which I kept in the hope that one day I might have time to work on re-writing it." Rights buying is significant for another group at the London Book Fair, Literary Scouts. They should not be mistaken for talent scouts in the everyday sense. Although they do scout for new talent, they do not deal directly with unpublished authors. Literary scouts who are based in the UK, such as Anne Louise Fisher Associates in London are the editorial ears and eyes for the publishers for whom they work outside the UK. In each country their client is a publisher looking for books which they can then publish in their country, either in the English language, such as in America or in translation elsewhere. Literary scouts know the peculiarities of each market, such as a preference for hardback or paperback, book club titles or who buys which kinds of books in translation and the particular preferences of individual publishers. The London Book Fair brings all these people together in one place for a three day frenzy of hard-working and hard-networking activities. For one visiting agent's inside view from the Fair, take a look at the insights of Agent Kristin from the Nelson Literary Agency Pub Rants. Part three - What do People do All Day? Part two - LBF - should Unpublished Authors attend? Part one - Last Chance for a Discount - Introduction. So was I Dorset Girl and I agree the whole thing was just vast. Bet it was another whole different experience and perspective to be there with your publisher Dorset Girl. Hope it went well for you. Perhaps another year we could plan a pub, day and time and do a TVFH lunch-time get together at the LBF? Sounds like now it's time to put our collective feet up for a rest. "Perhaps another year we could plan a pub, day and time and do a TVFH lunch-time get together at the LBF?" That sounds a great idea Jen! Hi,this is an interesting article. Unfortunately I was unable to attend, so it's nice to get some feedback from the event.